Most people cringe at the idea of having a ‘root canal’, but in all reality they are much less scary than most people think. People often say that getting a root canal is a lot like getting a filling. The procedure itself involves removing the nerve within the tooth, then filling the space with a special filling material. After the root canal treatment is completed, there are often other restorative procedures needed to get the tooth back to perfect health and function. 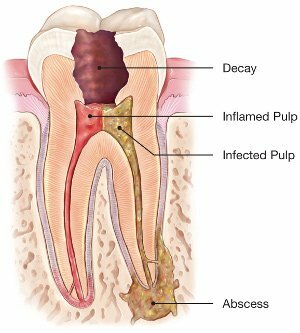 A root canal treatment is generally needed when the nerve of the tooth becomes injured and begins to cause pain or infection. Signs that suggest you may need a root canal may be swelling, lingering pain to temperature changes, or a dull throbbing ache associated with the tooth. When it is determined that a root canal treatment is needed, it is extremely important that we act fast to prevent severe pain or infection that could lead to loss of the tooth.